Cement is the latest addition in the list of export commodities in Bangladesh. Our country started exporting cement from January 2003. Crown Cement of M.I. Cement Factory Ltd. takes the pride of part of it. Earlier, apart from some production of state-owned Chhatak Cement Factory, the country was dependant on its import. In this context, local investors took the initiative for setting up cement factories and starts producing cement in 1992. The production in eight private factories stood 34 lakh tons in 1997, So far, about 100 Factories got government’s approval of which 56 factories are on production with a production capacity of 1.30 crore metric tons against a domestic demand of 60 lakh tons in a year. Research shows that there is a 12 percent increase in domestic demand of cement every year. But the investors cannot rely on only the domestic demand of the cement. They have to look for markets abroad. It is understood that there is no way to get the market abroad without producing international standard quality cement. M.I. Cement Factory Ltd. realized this in time. With its quality cement, the management tried to explore markets in foreign states including India. The Indian state of Tripura responded first. Verifying the quality of some brands of cement in Bangladesh the buyers from Tripura agreed to import crown cement. In this way local cement goes beyond the border. His excellence commerce minister Amir Khashru Mahmood Chowdhury cut the ribbon in the factory premises at Mukterpur in Munshiganj on January 3, 2003 for exporting the consignment of cement to Tripura, India. In the modern days, there is no alternative to cement for construction works. The state owned Chhatak Cement Factory and Chittagong Cement Clinker Factory were the only two cement factories, which had been producing cement in the post liberation period. As their production capacity was much less than the market demands, cement were being imported to meet the necessity. But in the name of imported items market had been flooded with adulterated cement. As a result, consumers could not rely on any one of those brand. In this scenario, local manufacturers came in the line in decade ’90 and thus consumers started changing their mind over the quality of the cement. In this continuity, M.I. Cement Factory Ltd. was set up on the bank of river Dhaleswari in the industrial belt of Mukterpur in Munshiganj district, nearest to the capital city of Dhaka. The foundation stone of the M.I. Cement Factory Ltd. was laid on December 11, 1998. Primarily the daily production capacity of the factory was 600 metric tons as it follows the world famous O-Sepa separator of Japan. M.I. Cement Factory went into operation commercially in 2000 and marketed its products with the brand name of Crown Cement. From the very beginning, it has maintained a non-compromising position on its high quality. As a result, it has gained huge popularity in the market. Due to increase of demand, company set up its second unit with the capacity of 800 metric tons per day within two years. Altogether the factory has been producing 1400 metric tons of cement per day from September 6, 2002. Crown Cement is accredited by BUET, BSTI and LGED. Each and every consumer now knows that Crown Cement attaches highest priority for maintaining its quality, weight, and services. The company mission is to provide Bangladesh with high quality cement for solid foundation of its physical infra-structure. A team of excellent efficient work force is in its employment who feels a homely atmosphere in the company. We try to give them liberty to contribute their best in production of quality products and imparting high quality services to the utmost satisfaction to its customers. They work here with perfect zeal and responsibilities in co-operative unison. Catering to the home market our vision is to cross the boarder and let our product to enter into world market. • Provide highest standard products and secure customers satisfaction. • Secure strongest competitive production through creative product and operational excellence. • Have highest entrepreneurs’ skills. • Create a team of employees of highest professional skills. • For conversation of natural resources to engage in research and innovation to use alternative raw materials where possible. • Extension of facilities to customers MICFL has taken steps to supply to customers cement in bulk through its bulk carries and also in form of ready mixed concrete direct to construction site corporate nature in management. Each research studies have some identified objectives; researchers usually attempt to achieve these objectives through all his efforts. The main objective of this report is to identify issues and factors affecting marketing operation of MICFL. 1. To understand marketing procedure of MICFL. 3. To find out the competitive strength and weakness of MICFL as well as other market challengers of this industry. 4. To find out the recent market conditions. 5. To have some ideas about how changes in market offering influence the consumer behavior. 6. To understand the important areas of consumer expectation regarding product package offered by the cement company in our country. 7. To prepare some guidelines and suggesting some policy which will be effective in securing customer satisfaction by analyzing various market situation. According to the topic of my report, which is about marketing operation and discussing the current marketing system of M.I cement factory limited – I basically follow the semi-structured method. All necessary Information Have been collected on the basis of personal discussion or conversation with various divisional employees of M.I cement factory limited rather than a structured questionnaire. Report is done also by taking considerations of report of M.I cement factory limited along with various journals, handout published by M.I cement factory limited. Here, we also are seeking information from the website of the company. Primary data sources were survey and personal interview. Secondary data sources were various books (for theory), related papers of the organization and previous report. Some of the data are collected through Internet. The Training Department has failed to give proper directions. Lack of cooperation by the concerned department. Due to resource and time constraints it was somewhat impossible to interview sample groups of mobile users, which is representative of the population. Due to some barriers all the desired officials of MICFL were not interviewed. Marketing is a societal process by which individuals and groups obtain what they need and want through creating, offering, and freely exchanging products and services of value with others. Market segments can be identified by examining demographic, psychographic, and behavioral differences among buyers. The marketer then decides which segments present the greatest opportunity – which are its target markets. The marketplace is physical, as when one goes shopping in a store; markets space is digital, as when one goes shopping on the internet. Many observers believe that increased amounts of purchasing will shift into market space. And meta market describe a cluster of complementary products and services that are closely related in the minds of consumers but are spread across a diverse set of industries. A marketer is someone seeking a response (attention, a purchase, a vote, a donation) from another party, called the prospect. If two parties are seeking to sell something to each other, we call them both marketers. Needs are the basic human requirements. People need food, air, water, clohtin, and shelter to survive. People also have strong needs for recreation, education, and entertainment. These needs become wants when they are directed to specific objects that might satisfy the need. Demands are wants for specific products backed by and ability to pay. 1. There are at least tow parties. 3. Each part is capable of communication and delivery. A transaction is a trade of values between two or more parties. Relationship marketing has the aim of building mutually satisfying long-term relations with key parties-customers, suppliers, distributors- in order to earn and retain their business. The marketing environment consists of the task environment and the broad environment. The task environment includes the immediate actors involved in producing, distributing, and promoting the offering. The main actors ate the company, suppliers, distributors, dealers, and the target customers. The broad environment consists of demographic environment, economic environment, natural environment, technological environment, political-legal environment, and social-cultural environment. M.I. Cement Factory Ltd. has a group of skilled engineers, foreign trained chemist, and experienced technicians who supervise its overall production. Behind the screen, there is a promising, honest, and experienced management to oversee the whole thing. We, the crown cement management, has been doing business for about 40 years in this line. So, we believe that there is no alternative to quality, accurate weight, and excellent services. M.I. Cement Factory Ltd. so far appointed 325 persons as skilled manpower. In addition to this 500 people are also associated with its marketing and transport departments. We think about 3000 members out of 825 families depend on this factory for their livelihood. M. I. Cement is basically a grinding mill that imports raw materials and manufacturers the final products. It started in 2000 with a production capacity of 180,000 MT annually. The product having high standard quality found its great acceptability to customers, ranging from individual builders to contractors or corporate organization. Soon the management of M. I. Cement Factory ltd. took the expansion program and set up its 2nd unit with another 240,000 MT per year’s production capacity in 2007. Presently the M. I. Cement Factory ltd is producing two types of cement depending on customers such as customers’ choice viz. Like the most of the cement mills in the country, M. I. Cement Factory ltd is also grinding mill and almost all the raw materials are imported. It imports mainly from Thailand, Indonesia, Korea, Japan, and India. At first the management representatives visited such countries and manufacturers of raw materials to ensure desired quality conforming to produce quality cement. For producing composite cement M. I. Cement Factory ltd imports slag from Japan for an additive with clinker. After arrival it tests the raw materials through some known trading houses who have been tested to be bonafide and dependable. “Crown Cement”, the brand name of M. I. Cement Factory ltd’s product, is marketed in 50 kg packing. It is packed either in Kraft paper bag or P.P. woven bags. Presently taken steps to satisfy needs of some customers for supply of cement in bulk and also ready-mix concrete. The company arranges training to its employees and workers in their respective field both internally and also engaging experts on contractual basis. Also let some of the key personnel to attend workshop and symposium on cement matter both at home and abroad. Technical assistance & guidance to the end-users. The company has its well-versed engineers and other marketing team who constantly get in touch with the seller and consumers impart technical assistant and advice in construction work. The factory produces 420,000 metric tons or 8400,000 bags of cement yearly. Crown management tries to deliver the products to its clients directly from its factory through different routes. M I. Cement Factory Ltd. markets its product through some distributors and dealer scattered all over the country. But cement is reached to the retailers and end-users by the company through its transport facilities. It also directly sales cement to customers ranging from individual home builders to contractors of industries, developers and corporate organizations and reach the product by M I. Cement Factory Limited’s own care. The M.I. cement factory limited has three distributor and twenty dealers who are working directly with the retailers. More than three hundred retailers are participating with MICFL for facilitating retail scheme. To uphold the acceptability and to communicate to customers the attribute of Crown Cement M. I. Cement have resort to advertising in different media. In various conspicuous places in the country eye-catching Bill Boards brandishing the name of the product are installed which have exceeded 50 in number. In some important points decorative neon-sign board are placed to attach public views. The selling outlets are scattered all over the country. Shop sign with attractive painting of he shop advertising Crown Cement is a common feature. TV ads are telecasted almost everyday propagating the characteristics of Crown Cement. Show-rooms are set-up in different fairs with posting of representative to answer different queries of the intending customers. Conference & Meeting: Meet of the construction engineers and also at different parts of the country are held, assembled them in discussion meetings to inculcate in them the specialty of Crown Cement and having its high quality as construction material. News Paper Ad. : Besides some sporadic advertisement in printing media, paper ads are specially published in some special occasions such as Eid festival, Christmas Day, Puja festival, Independence Day, Victory Day, etc. Through renowned media agents documentary films featuring various aspects of Crown Cement are prepared and exhibit /projection them in public gathering, meets and conference. Discussion Meeting with Distributors and Dealers are held once a year exchange views with them and get feed back from them in respect of utilization, quality, etc as observed by different end users. The different corporate bodies are among the valuable users of Crown Cement Day by day the customers for Crown Cement in this field are increasing as they are gradually finding the compatibility of the locally manufactured cement of the local entrepreneurs. Their previous notion about the supremacy of multinational company’s product is being changed after use of Crown Cement side by side with that of the former. So, Crown Cement customers in real estate owners’ developers, industrial builders are in increasing trend. 11. Essential Drug Ltd., Bogra. 16. Safipur Ansar Academy Extension project, Gazipur. 21. Shadhinata Sriti Shoudha, Dhaka. 2. Bea-Con Pharmaceuticals (Orion Group), Valuka, Mymcnsing. 5. A. C. I. Agro-vet (Pvt.) Ltd., Valuka & Serajgonj. Cement Factory Ltd. has imported machinery from P. R. China designed by reputed qualified designer of ZTIFC with the goal to achieve quality production continuously. The plant also has Japanese Technology to separate fine cement from the coarse one. Total operation is controlled from the control room by auto signaling system for each device which instantly informs the Engineers and duty about the performance fluctuation from ideal parameters of all most all machinery in operating so that the concerned technical personnel can easily up hold quality production. In packing section the main equipment was manufactured with German Heaver Technology which ensures accurate packing of cement in each bag for long time. Our Engineers always careful make time to time calibration of cement of machinery where required to keep soundness and accuracy of operation. The phony of M.I. Cement Factory Ltd. is to market kept product of consistent quality at home and abroad as per world standard procedure in accordance with good manufacturing practices in sate of the plant and process, packet in appropriate packing and remain committed to this objectives at all time. M I. Cement Factory Ltd. adopted ISO 900: 200 ads the model for their quality management system. Accordingly a documented system of procedure and instruction has been established throughput the organization defining business process, responsibility, & authority. Management is committed the resources and creating an environment in which each employee can contribute his/her skill, talent and ideas in the never ending process of improvement and all aspect of business. We are produce two type of cement in our factory. 3. Raw materials used in prosses: Clinker, Gypsum, Fly ash, slag and Lime stone are used in grinding cement factory like M. I. Cement factory Ltd. All raw materials are tested at our quality control department before import. If the standard of sample is satisfied, then it is permitted to import. For this, M. I. Cement factory Ltd. always uses a high quality of clinker to make elevated Cement. When the vessel with clinker comes to our jetty, again the sample is collected by Q. C. personnel to test both physical and chemical properties of the clinker. After completion unloading of clinker is started. This system follows for each raw material. All raw materials are preserved in a well protected shade to resist the absorption from rain water. Raw materials are used to process. Initially, the clinkers crushed by Jaw crusher to make uniform size ( On this connection following parameters are tested to control and check up quality of Crown Cement. During running production our Q.C personnel. Eel collects the fine cement from the silo bucket elevator each hour. We also collect Cement Sample from the peaking shop after definite intervals. Cement samples are from plant in 24 hrs during processing are blending together in a vessel and tests are carried out on Following parameter at our laboratory daily testing. Properties, test methods, and minimum testing frequencies carried out at our laboratory. Besides its moisture should be tested because strength of cement is rapidly deteriorated due to the high moisture. Quantity of raw materials or cement taken at random for the intended tests or in accordance with a sampling plan, from a larger stock. E.g. lighter Vessel, trucks, bags, silo etc. Or from a given lot. Stapling is carried out using particular sampling equipment. The frequency of sampling and the type of sample e.g. Spot sample or composite depends on the requirement to satisfy the standards. Blaine is an important test for Cement. A rapid development of strength high fineness (Blaine) is a vital property of cement. This parameter is tested at our laboratory in accordance with ASTM C 204 by the test method for fineness of hydraulic Cement by air permeability apparatus per one hour after. Then we plot the result of Blaine against time daily, weekly, and monthly for high checking of quality on our product (Crown cement). An ideal setting time always helps to again the strength of cement. in actual construction dealing with cement paste, mortar or concrete Certain time is required for mixing , transporting, packing and finishing. During this time the cement paste, mortar and concrete should be in plastic condition. The time interval for which the cement products remain in plastic condition is known as the setting time. Our laboratory personnel test this parameter in accordance with ASTMC 191 by the test method for time of setting of Hydraulic Cement by Vicat Needle twice in a shift. We consider the initial setting time (100 min-120 min) and final setting time (240 min-280 min) due to quality of Crown Cement. Compressive strength is the most important test of cement. High quality of cement means high strength of cement. We regularly test this parameter on Crown cement at our laboratory for 3 days, 7 days and 28 days as per ASTM C 109 using 2-inch or 50 mm cube specimens. We maintain the temperature of mixing and cursing water and the humidity of room during test. This test is required to measure the water content in cement for testing setting time test. Moisture is the main enemy of cement. Strength of cement may be deteriorated due to moisture. This we import moisture free clinker. Moreover, moisture of Cement is checked by our laboratory personnel at running production. Besides it, everyday, percentage of LOI, SO3 and chemical properties are tested chemically at our laboratory according to ASTM C 114 to check the retardation and expansion of Cement. All records of tests and analysis have been keeping in suitable format in the separate register book. Newly Installed Equipment: We have established another for testing quality parameters to ensure the standard BDS EN 197-1: 2003 at our laboratory. All necessary EN standard equipments have already been procured and we will provide these testing facilities in addition of ASTM method. Our testing schedule is now added as follows. Properties, test methods, and minimum testing frequencies for the auto control testing to be carded out for Crown cement at our Laboratory. Property Type Minimum testing fraquency as a routine test. High quality Clinker and Gypsum are used in M.I. Cement Factory Ltd. as its raw materials. These materials are imported directly from Indonesia, Thailand, Malaysia and Korea. The imported raw materials are preserved in a well-protected place to maintain the quality of the materials intact. SGC, the world famous testing institutes certifies the quality of the raw materials before those are imported. Raw materials are also tested in its own laboratory. M.I. Cement Factory Ltd. is being produced in the ‘Close Circuit’ technology. In addition to this, the O’Sepa Separator System (Japanese technology) assures the fineness of the cement. The whole production system is computerized. By dint of quality management M. I. Cement Factory ltd. earned the certification on ISO 9001:2000 quality Management System (QMS).This achievement accomplished within a period of 2 years of operation with the performance of its devoted and diligent work-force. M. I. Cement Factory cares for keeping the environment free from pollution. So it takes appropriate measures for preservation and protection of environment. For this end in view it keeps its desired mechanical devices and gives due emphasis for well congenial health condition within the factory for its employees. For financial security against any mishappening it brings its employees under of Group Insurance facility. 1. 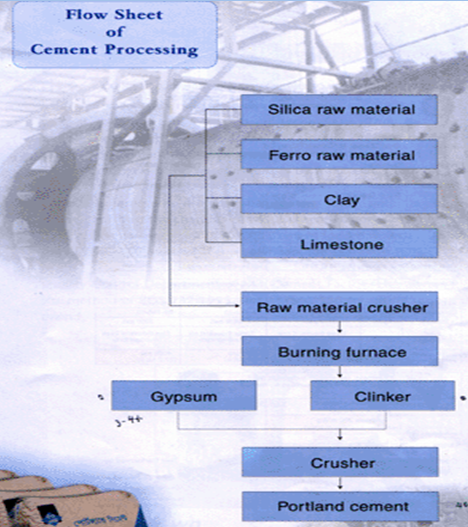 Types of Cement (OPC/PCC). Table-1. Trend of different types of cement produce in Bangladesh. In overall basis, the companies are mainly produce two types of cement for our local market. The types are Ordinary Portland Cement (OPC) and Portland Composite Cement (PCC). Table-2. Trend of Installation capacity and Actual consumption in Bangladesh. This study has found that Crown cement is in 6th position and the top most position hold by Shah Cement. It has been found that only 6% of market share based on production capacity, hold by Crown cement. It has been found that only 7% of market share based on consumption capacity, hold by Crown cement. 3. Different aspects of cement (Quality, Service, Advertisement). This study has found that companies are very much concern about the production of quality full product now-a-days. The current survey has revealed that 50% respondents to view quality as excellent, 25% very good, 20% good and 5% average. In this study it has been found that 50% respondents agree on excellent service providing to the customer, 25% very good, 10% good and average 15 %. This study has revealed that of the total respondents 10% have perceived advertising to local market as excellent, 20% very good, 20% good, 35% average, 10% bad and 5% worst. 4. Competing brand in Bangladesh. Table-4: The Brands those are competing very prospectively in the local market. The current survey has revealed some special remarks about the competing brands those are Quality, service, pricing, brand image, Delivery, quality control, sales, advertising, Commitment to the Customer, efficient Management, market penetration, segmentation, World wide renown, Full production & consumption, market positioning, and market coverage etc. 5. Some special features of Cement Industries. • Strength, setting time and finesse up to mask. • Maintaining accurate raw materials for PCC. 6. Current market price of different brand of cement (per bag only). Table-5: Different Company’s price and percentage of dealer and corporate customer. In this study we have found that different brand and their price offer to our local market and percentage of their dealer and corporate client. The price range for dealer 320 to 365 (taka) and corporate 325 to 360 (taka). The average percentage of dealer is 78 % and corporate client 22 %. 7. Different types of payment system used by Cement Company to sell out the product. 8. Difficulties to sell out the Cement in Our local market. • Local company providing some credit in the market. • Low Price of different local brand as using clinker in low proportion, Political problem, price increase at Bricks and rod. • Difficulty in pricing, quality weight, and lack of marketing teem. 9. Cement Companies importing raw materials from different countries. Of the total respondents, the study reveals that only 26% provide other advertising such as wall paint, shop paint, sticker, bus decoration etc. 18% bill board advertisement 15% Paper advertisement, 14% door to door advertisement 12% hand bill, 12% TV advertising and 3% cable advertisement. 12. Presently the Promotional activity taken by cement industries in Bangladesh. • Sales promotion scheme to retailers upon fulfilling target, retailers will be rewarded and prize. • TV advertisement, Shop Sign board, wall painting and gift items etc. • Increase conference with engineer, and mason. • Chain of command should be strong . • Increase number of employee. • Reduces the overdue amount. • Price policy should be fixed. The report should start the concluding part by restating the hypothesis of the study. The report hypothesis was, “Although Crown Cement limited is leading the market of cement industry with a sharp distance, and their customers are not fully satisfied with the company’s marketing services. If crown cement does not take care of these dissatisfactions and another company enters the market with similar offers, it will be difficult for M.I cement factory limited to keep the current market share intact.” From the analysis of the survey results, it is clear that crown cement’s consumer, retailer, and dealers are dissatisfied with different mode of services offered by the company. Moreover, they clearly pointed that if another company comes with similar offer, they will not hesitate to switch. So, the report hypothesis is proved as a valid one. So Crown Cement should continue to make additional investment to further expand the coverage and increase the capacity of its network. The company is committed to provide quality service all over Bangladesh and render towards having a satisfied group of customers.